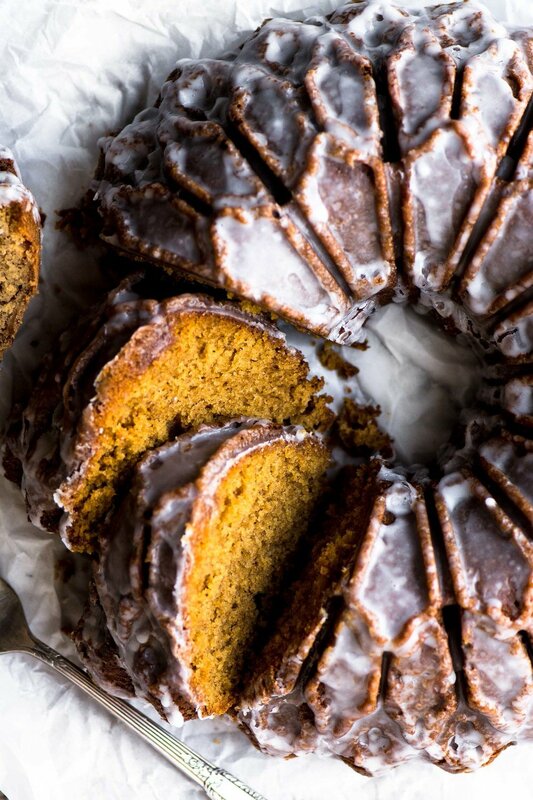 Prep your bundt pan by brushing with melted butter and then dusting with flour. Be sure to get in all the crevices. Whisk the flour, cornstarch, baking powder, salt, and spices together in a bowl. Cream the butter and oil together with the sugar. Blend in the eggs and molasses. Add the dry ingredients alternating with the half and half, beginning and ending with the dry. Mix just until thoroughly combined, but don't over mix. Pour the batter into the prepared pan and bake for about 40-45 minutes, or just until done in the middle...you can check with a toothpick. Let the cake cool in the pan for 15 minutes, then gently loosen the edges and carefully invert onto a cooling rack.